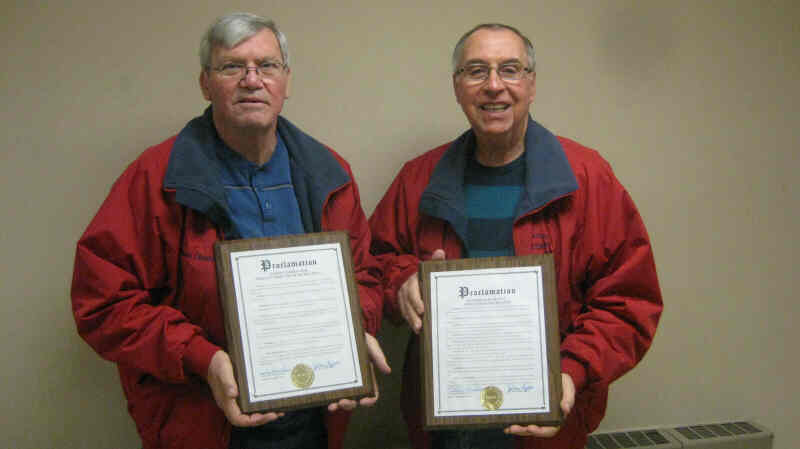 Last month the town of Raritan honored Rich Bartolucci and Bob Andreychak for their decades of excellent work running the Raritan Recreation Department. For anyone who has seen them in action it was indeed well earned. Raritan Recreation runs many things. The youth sports are baseball, softball, indoor soccer, and basketball. For adults, there is volleyball and basketball. Recreation also operates two kiddie pools. One at Frelinghuysen Park and the other at Basilone Park. "Arts and Crafts" is held every weekday in the summer at both parks. Always looking to improve things, recent additions have been the Zumba Class which is now in its third year. And just this year a girl’s Cheerleading Program has been started. In addition to sports programs Rich and Bob run several popular annual events. 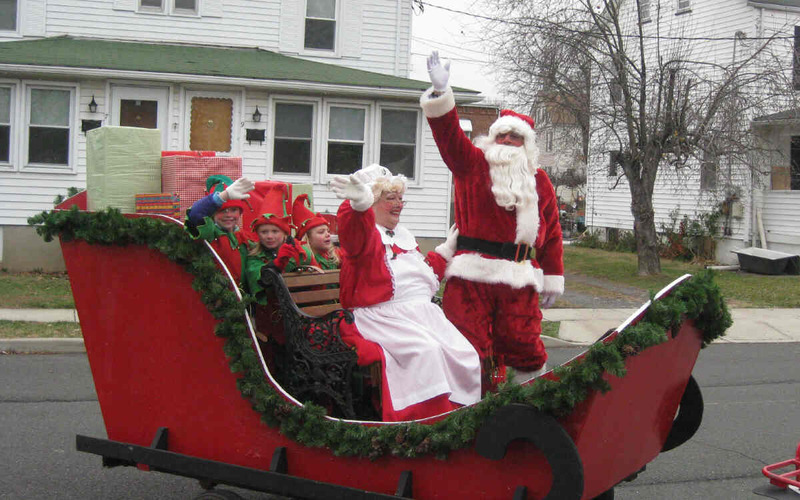 They include Santa Claus Comes to Raritan, The Easter Egg Hunt, Halloween Parade / Costume Contest, and Christmas in July. These events are well attended, well run and a lot of fun for both kids and their parents. They make it look easy. But as anyone who has tried to run any event knows it is never easy. It is through Rich and Bob’s proper planning, years of experience, and competence that results every event running like clockwork. But perhaps their greatest strength is their enthusiasm for their work. They always have a smile on their face and they are glad to talk to anyone. Both Rich and Bob seem as happy as the kids themselves. A variety of tasks have needed to be done over the decades - such as infrastructure changes and renovations. Pools have needed major upgrading and the baseball field needed work. For some of these improvements, such as the installation of the scoreboard at the Little League field, Rich and Bob have poured the cement themselves. 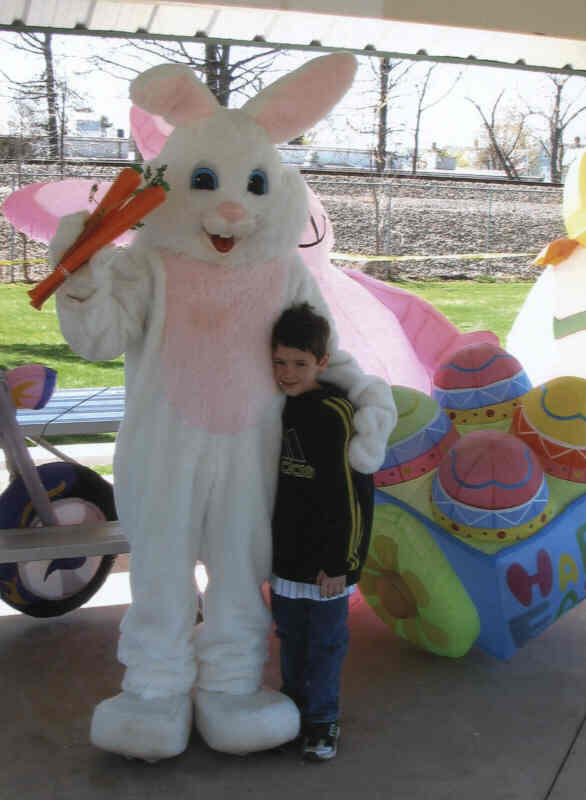 Raritan Recreation has even done some charity work over the years. One activity from past years includes providing toys to kids at the Mountainside Hospital. 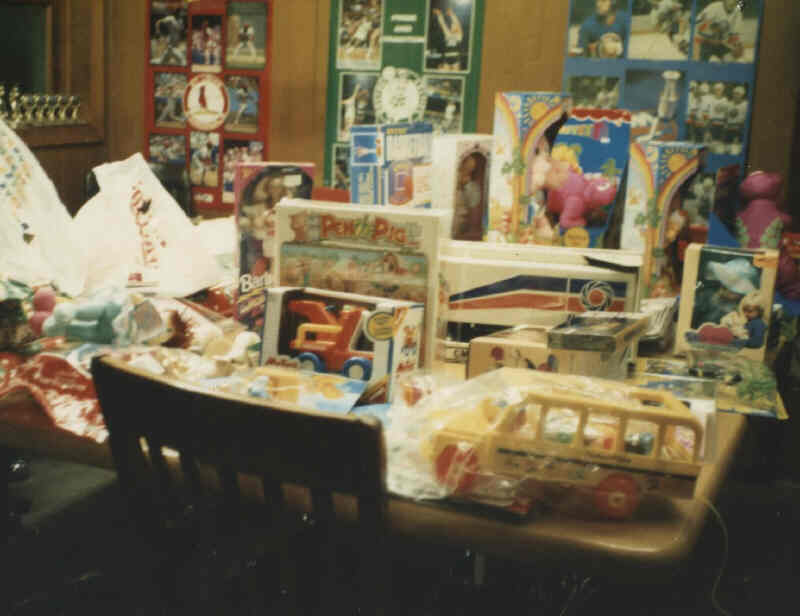 These toys were delivered to each child by none other than Santa Claus himself. Other times the recreation department has delivered meals to local people who needed them. There have also been “Koats for Kids Drives”. In recent years at Christmas time they have lit up the Raritan Train Station with Christmas Lights. Just last year they obtained a real Christmas tree that permanently sits in front of the Municipal Building. As Raritan kids they played in the sports programs that they run today Both Rich and Bob are both lifelong Raritan residents. Rich Bartolucci, the director for 35 years now, grew up in Raritan on Anderson Street. He attended the Raritan Public Schools. Today he lives next door to the house he grew up in. Bob Andreychak, the assistant director for 25 years, as a kid lived on First Avenue. He attended St. Joe’s School on Somerset Street in Raritan and today he lives near Frelinghuysen Park. As youths Rich and Bob played in the Little League Baseball program that they would later run. 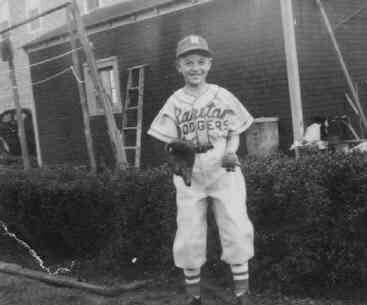 Bob Andreychak started in the Little League the second year of the program in 1953. Rich Bartolucci, who is two years younger the Bob, started in the Little League in 1955. Thus during Rich’s first season he and Bob played in the same league. Bob was on the Dodgers and Rich was on the Giants. That year Bob Andreychak was awarded the league MVP. A trophy that dates back to 1952 that lists all the Little League MVPs (including Bob) is today a proud fixture in the Recreation office. 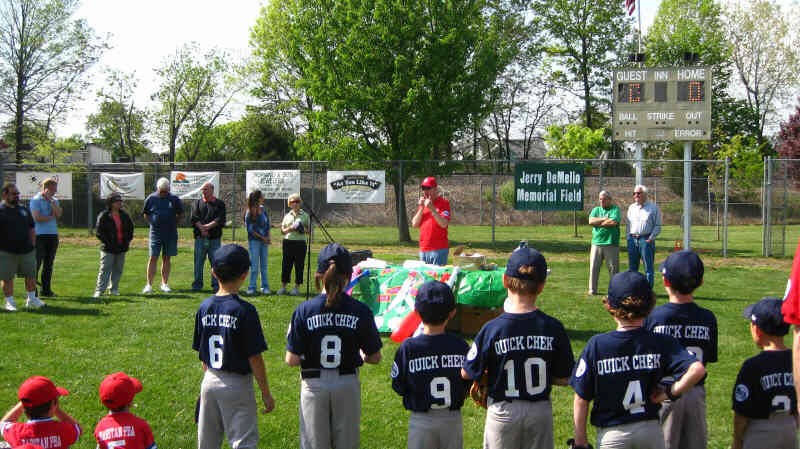 In addition to the formal Little League Baseball program Bob and Rich both played in the after school pickup baseball games that were held at Frelinghuysen Park. So many kids wanted to play that they had to race to get there as any late comers missed out on being included in the game that day. They recalled that as teens the sports around town were played with intensity. One league in particular that they played in stands out in their memory. There was a local CYO baseball league. A few times a year St. Joe’s of Raritan played against St. Ann’s of Raritan. With local bragging rights on the line each parish’s team played with much determination to win. With such heated competition the words “Jesus Christ” were sometimes heard at the game, but they were said in quite a different manner than they were said in the churches on Sunday morning. Ironically decades ago Rich Bartolucci and Bob Andreychak often swam in one of kiddie pools that they manage today. The only problem here was when they swam in the pool they were teenagers and the pool was (supposedly) closed at the time. That little dip came about on hot summer evenings. After playing baseball at Frelinghuysen field the Raritan boys were usually hot and sweaty – thus a nearby pool, even if it was closed and only had three feet of water, was a temptation hard to pass up. Thus many of the tired players would sneak into the kiddie pool to cool off. These swims usually lasted only until the cops came and the boys took off over the railroad tracks. Back then there was no fence around the pool - thus getting into the pool or making a quick getaway out was easy to do. 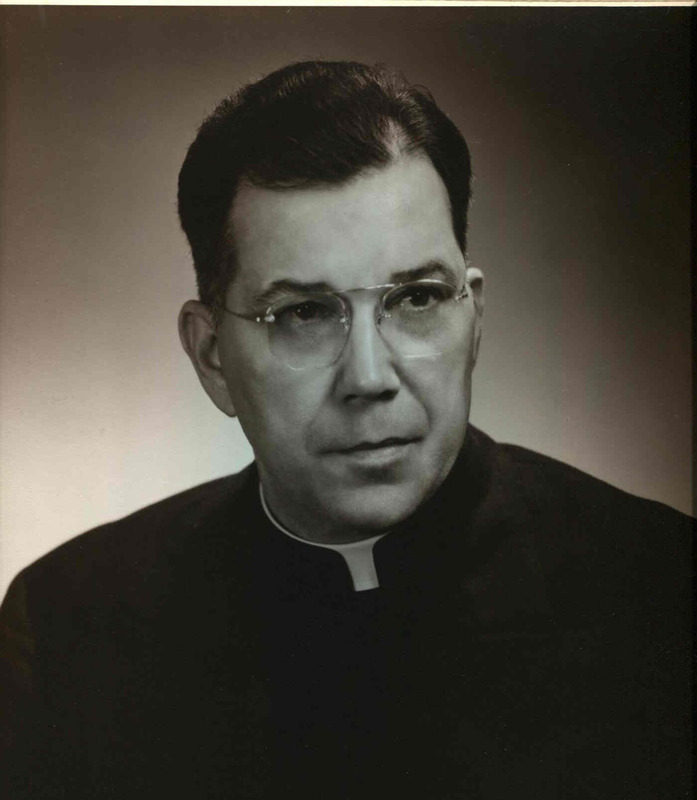 Bob Andreychak recalls that the importance of sports and recreation in the balance of life was taught to him by Father Olsovsky of St. Joe’s. When Bob was a young teen Father Olsovsky often took Bob (who was an altar boy at the time) out of St. Joe’s school for the day. The Father informed Bob’s teachers that they were going to bless houses in Raritan. Sinfully their religious retreat for the day did not include the blessing of too many houses, but instead included the driving of golf balls down the fairways at The Raritan Valley Country Club. You see Father Olsovsky was an avid golfer and he needed a caddie for his “spiritual” getaway. Bob gladly assisted the father in his religious endeavor. Father Olsovsky of St. Joe’s. 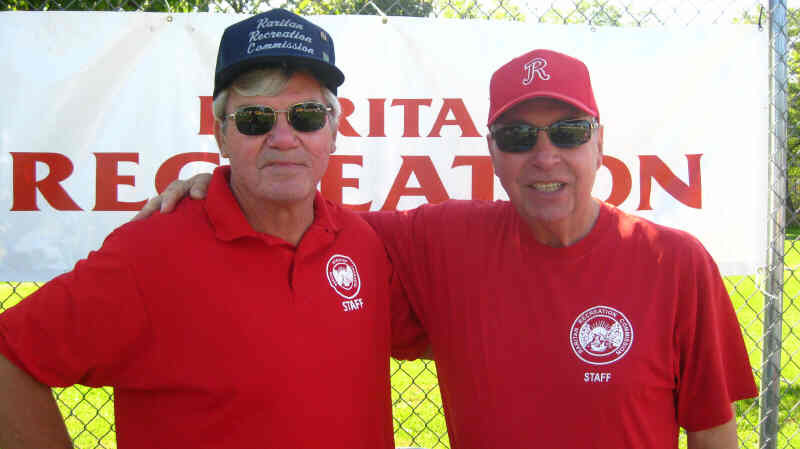 The town of Raritan has been blessed to have two such fine gentlemen run their Recreation Program.. Bob Andreychak sums up his tenure at Recreation by saying that the work that he does is him giving back to Raritan what Raritan gave him. He has great memories of growing up in Raritan and credits sports with setting him in the right direction. Rich Bartolucci says that Raritan has been an important part of his life. He has enjoyed most every aspect - from attending the schools, to going to the Candy Kitchen, to simply hanging out with the other kids. He said that so many of the other kids were like extended family to him. Thanks to Rich Bartolucci and Bob Andreychak! Rich and Bob are very grateful to their wives for all the help that they have given them over the years.